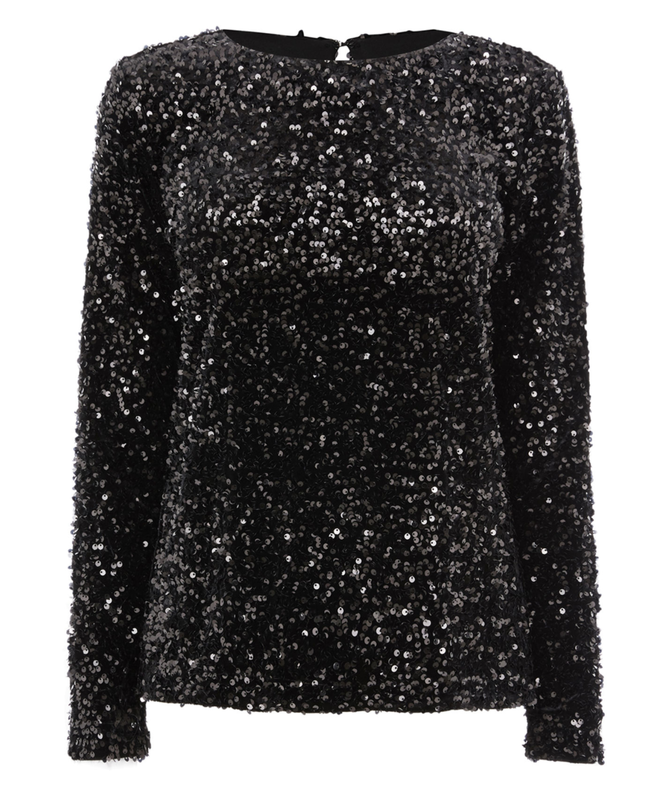 It’s party season – Sparkly tops for Out-Out! Last week it was about dresses but I know that’s not everyone’s cup of tea. 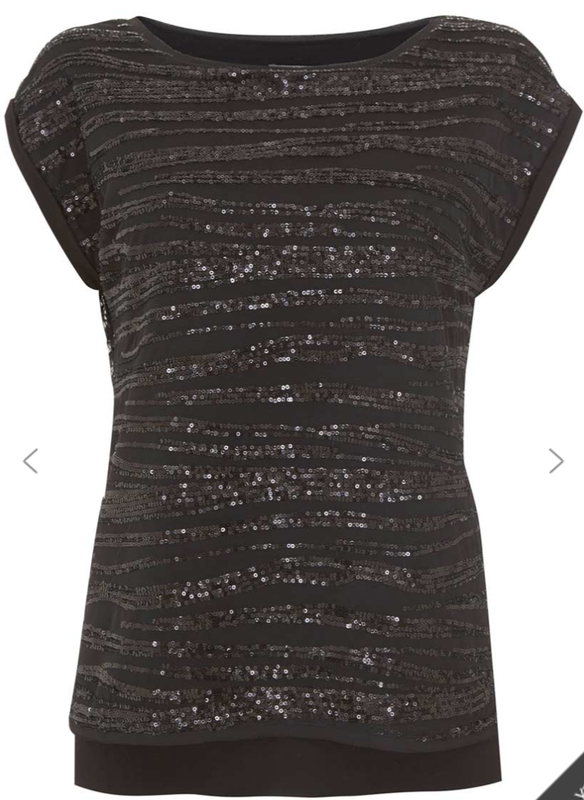 So I’ve been checking our sparkly tops that you can wear with trousers, skirts or jeans to get you in that party mood. Now there are a vast array of colours in store, but for the most part I’ve stuck to traditional black, silver or gold for inspiration but by all means do play with colour as there is a lot of choice on the high street at the moment, making it all very exciting. Mint Velvet is not normally a brand I head to, but I’ve had some feedback from readers that you want to see more about their range on my posts, and so yours truly has checked this brand out to see what they can offer in a sparkly come t-shirt that has a relaxed yet party-feel vibe, and I think this black linear top ticks all the boxes. 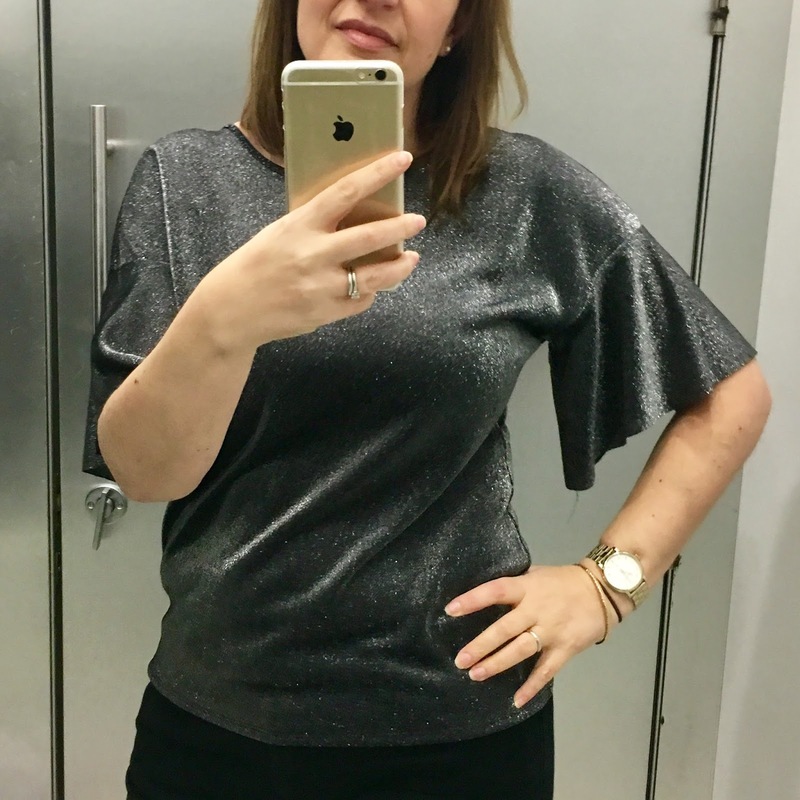 True to size for fit and what you can’t see, but I could feel, is that there is two layers to this top, the first being the sequins and the second a super soft (and I mean SUPER SOFT) t-shirt material underneath. Classic style and fit this is not too trendy so will last a number of years – I think the £69 is worth it! 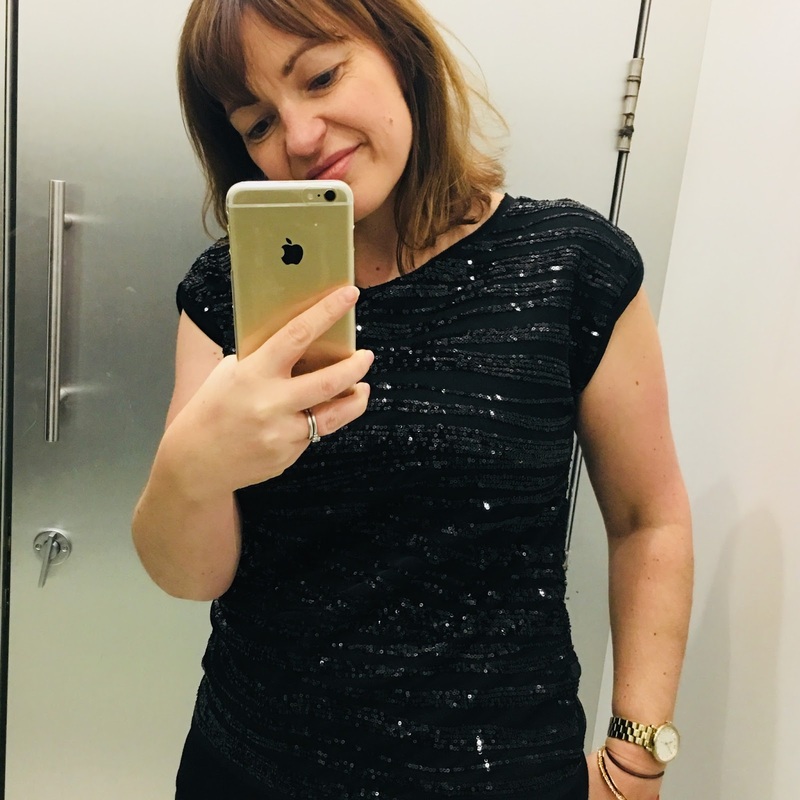 I loved the dress last week, in fact the dress made front cover of this month’s Hello Fashion magazine and whilst it didn’t suit me, I think it’s one of the best party dresses from the high street. They also do it in a top, if that’s more your thing. It’s also available in Navy, but sadly the Gold has sold out. I loved this on the hanger and thought this would be fabulous on, sadly I was unimpressed and I think the price-point of £36 is overstated. It’s extremely flimsy to the point where I would suggest a silky vest should be worn underneath to make it more flattering to wear. Size is true to fit and the one positive is I really loved the sleeves, but this is ‘trendy’ and I just do not think it’s worth the money in investing. Simple and easy-wear. This one ticks all the boxes if you want fuss free party wear that you can also quite easily get away with wearing during the day, this is it. 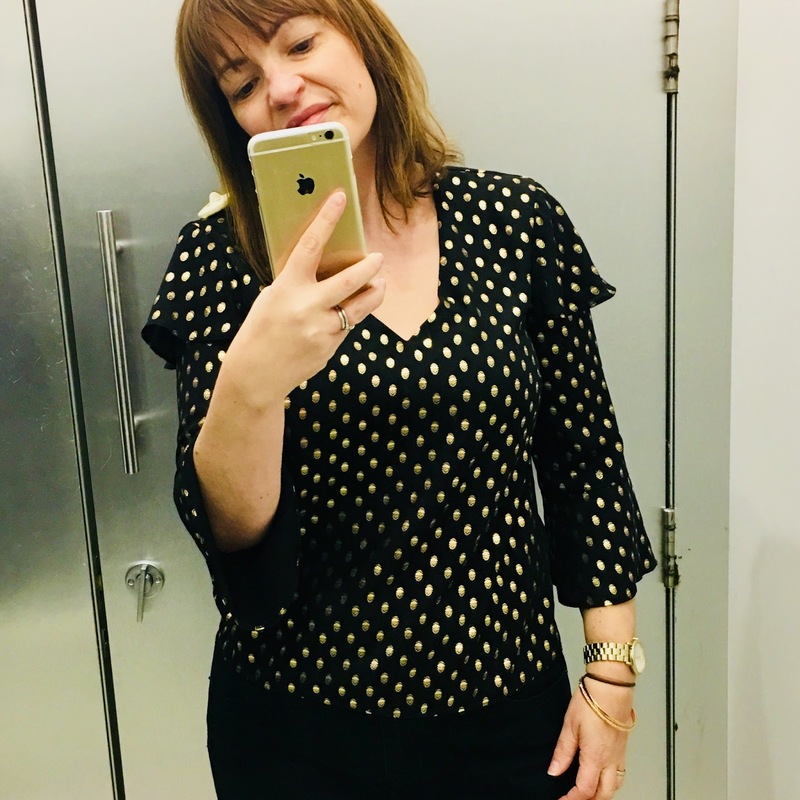 Loved the sleeves, it’s got a V-back but nothing too revealing and I think it’s a great price, true to fit – Well done Warehouse! This next one and the last one from Warehouse, promise! (there was so much choice I found it really hard to scale it back!) I would highly recommend to not buy this one online but to go in store and try it all. It looks fabulous on the website, it looks fabulous on the hanger BUT when you put it on (and believe me it was the correct size) it left a gapping hole right in the middle of the front??! WTF – I just couldn’t understand it, and I believe if you went down a size it would be bigger hole and if you went up a size then it would not create this lovely draping – I don’t get it – Buy with caution. Feedback last week on the dresses was that some of you are looking for warmth when you are heading out. 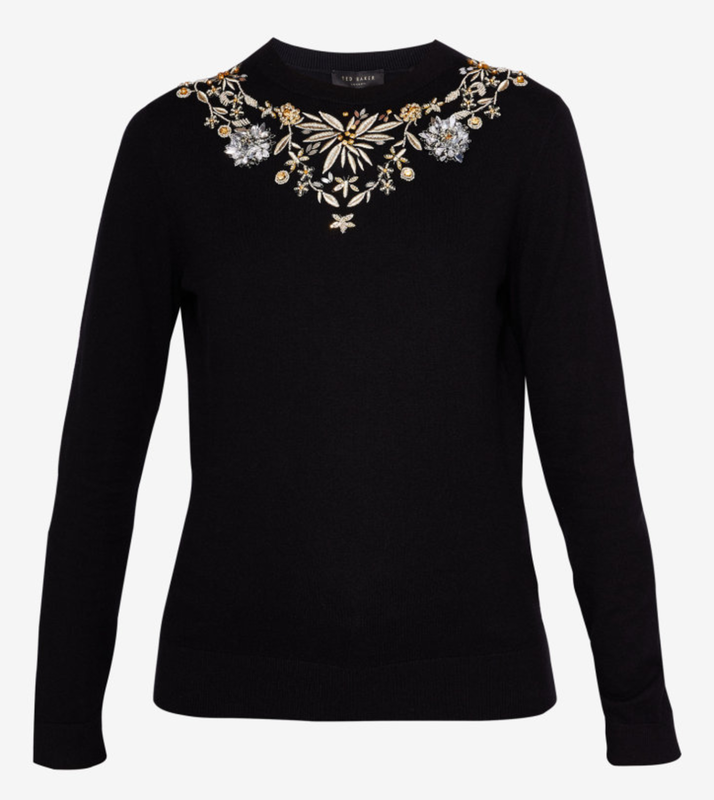 Sparkly and embellished jumpers come in a multitude of budgets, and for this choice I have particularly gone high-end, why? 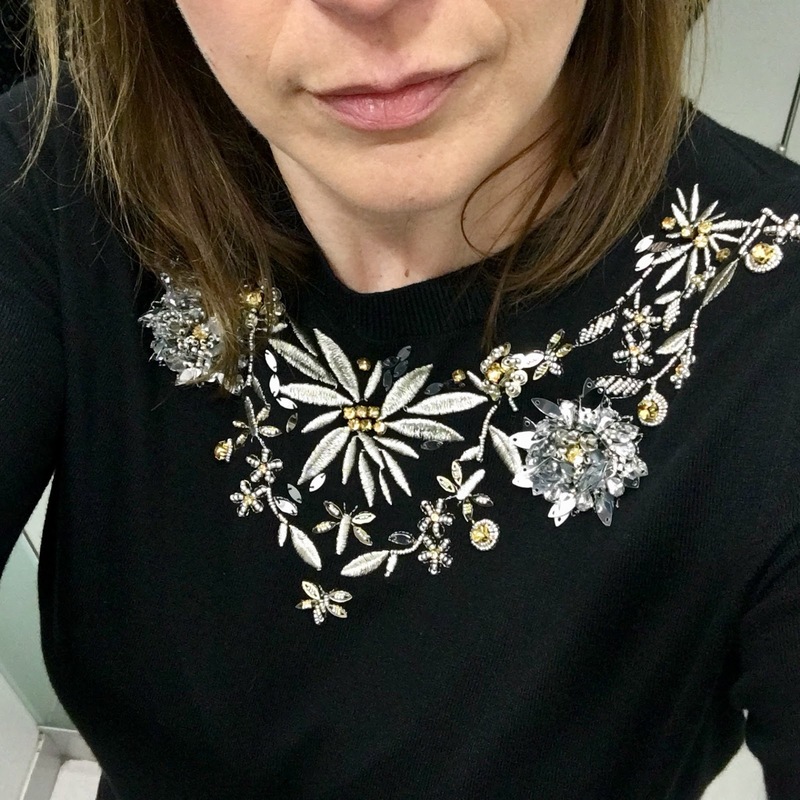 Well if it’s for a night out be it with jeans or a midi skirt you don’t want the top looking everyday – you simply will not feel glam or special wearing it and then because of that you will add a lot of fussy jewellery to compensate and then your jumper will not longer be the statement piece. 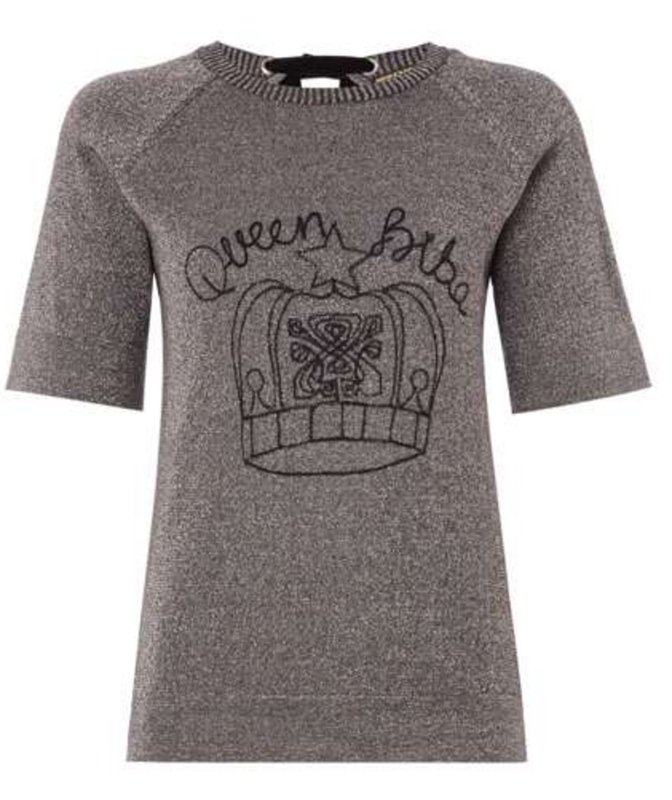 Ted Baker brand offers a lot of choice; you can go with a lot of bling or they even offer tone on tone for that high-end quality look without the christmas tree effect. 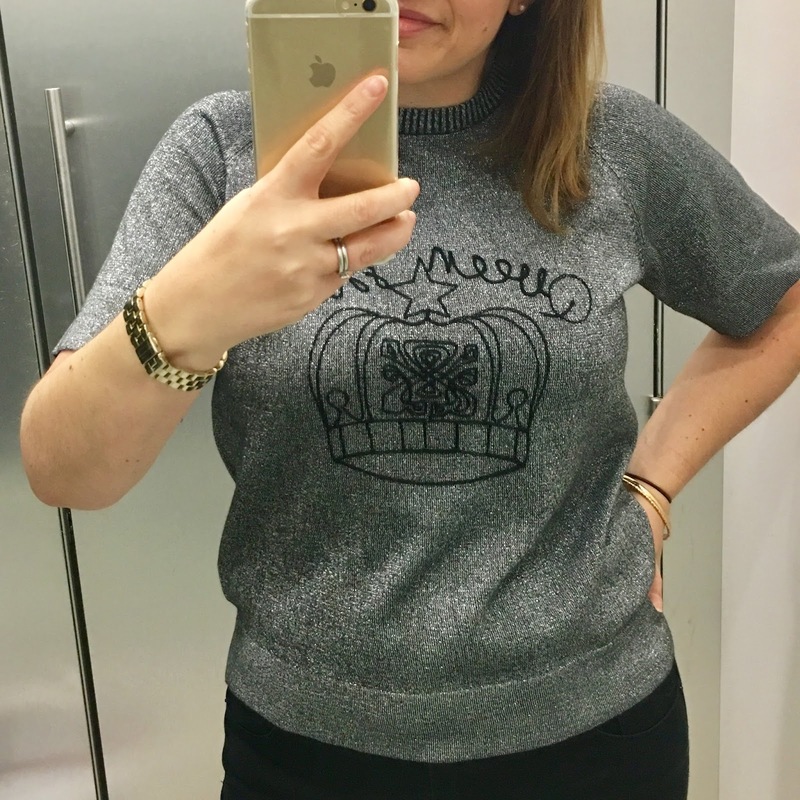 I think the choice below is a mid-point between the two, and again you will get more than one year’s worth out of this – so with a blended cashmere feel and with gorgeous detailing this is a fabulous choice – I had to go up one size for a good fit. 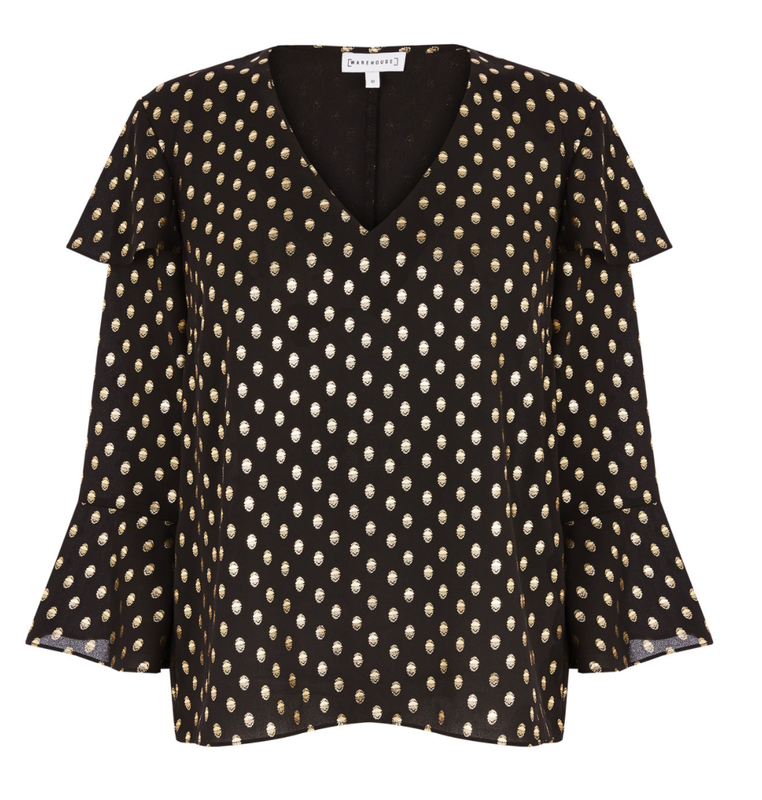 Now my love of Biba and all their sparkle I had to head there and after trying on so many tops, I saved Biba to last (hoping I may be purchasing!!). From the front I LOVED IT and I would have bought it if it wasn’t for two key reasons: Firstly the sleeves needed to be a either a tad shorter or 3/4 length – just above the elbow is not my style. But the biggest reason was the (very stupid) thick velvet tie you had to do at the neckline around the back, the design of it simply doesn’t match the top and once tied it made me feel that my hair would need to be down as I think it looked messy (notice below how it’s soooo perfect on the model 🙁 ) The sizing was true to fit and the quality and feel was lovely. Coming up next week on the blog – sparkly accessories, by which point I think you’ll be done with all the sparkle and ready to kick back and enjoy the festive season! 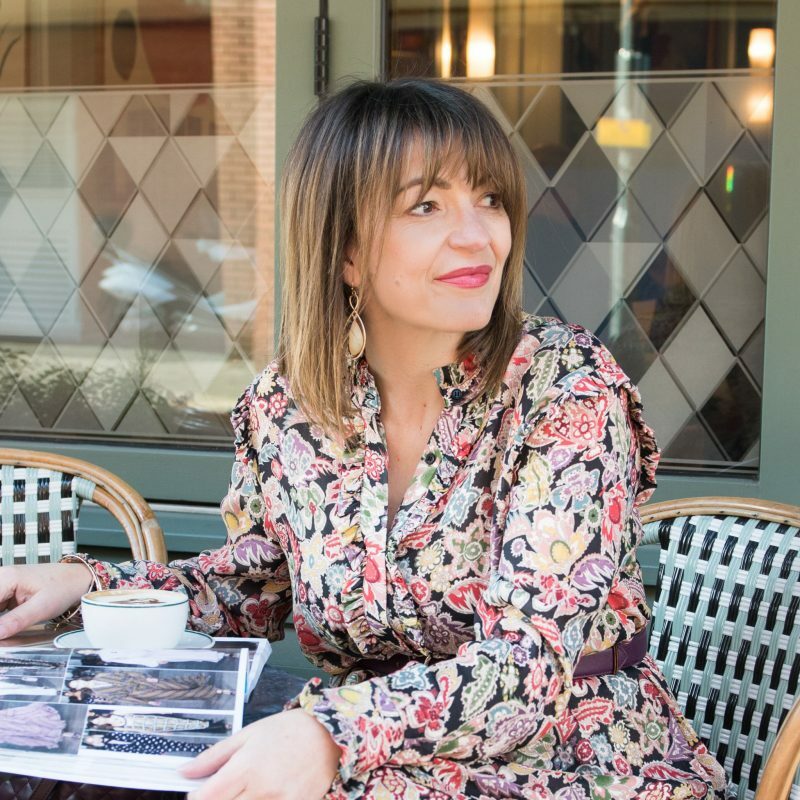 In between my posts you can keep up with all my daily outfit of the day posts over on Instagram – and you never know you might find the odd quote inspirational too! You don’t have to join Instagram, you can simply click here to view. 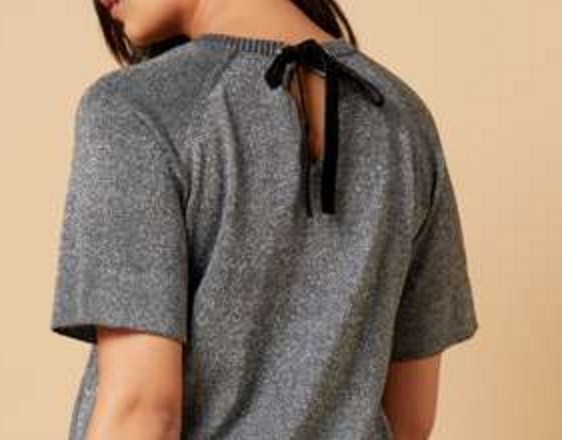 The post It’s party season – Sparkly tops for Out-Out! was on Loved by Lizzi first.